100% Employee Owned What is an ESOP? D&D Roofing and Sheet Metal want to Thank all of their employees for being voted 2018’s Best Roofing Company in the Best of Carson City’s Winners list. We couldn’t have done it without all of you! 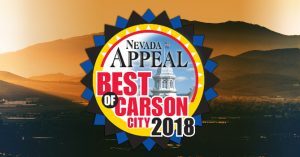 And a special Thank You to all of the residents of Carson City for voting D&D Roofing and Sheet Metal #1 for the fifth year in a row. You can view the entire list of winners here. D&D Launches New and Improved Website! ©2019 D&D Roofing and Sheet Metal.